Several years back there was an upstart print magazine that fell in the trap new publications sometimes encounter: putting down the competition in order to make a name for themselves. The magazine, which billed itself as a quarterly devoted to noir fiction, saw fit to denigrate EQMM and sister publication AHMM for typical grievances: being fusty. Out of touch. Closed to stories where people act violently and speak profanely. Since the print magazine launched with the help of the Internet, controversy and debate raged in loud tones in blog comments sections. The magazine, despite some top quality stories and reprints, lasted a grand total of two issues. EQMM celebrates its seventy-second birthday this year, while AHMM will turn fifty-seven. Yes, it’s hard to launch a new magazine, especially one devoted to crime fiction that pays writers. It’s also needlessly stupid to promote oneself at the expense of your purported competition. But I bring up this cautionary tale because of something that got missed in the hubbub: quality isn’t just about whom you publish from the get-go. It’s about years of archives, issue after issue of publishing the best in the field, and—when you aren’t looking—helping to define a lost generation of writers. I am proud to say that EQMM has been good to me as a fiction writer, publishing two of my stories six years apart (I’m slow.) But, even though I’d read issues of the magazine off and on, seeing familiar names like Ed Hoch, Doug Allyn, and Brendan DuBois, and paying close attention to the Department of First Stories to see which writers would publish further stories and novels, my sense of EQMM did not fully form until the spring and summer of 2012. I’d just signed a contract to put together an anthology of stories by women writers who published their work primarily between the early 1940s and the mid 1970s. Some choices—Charlotte Armstrong, Margaret Millar, Dorothy B. Hughes, Shirley Jackson—were obvious, their reputations in the solid to standout range among avid mystery readers and, to a lesser extent, the general reading public. But for every enduring reputation, there were writers completely neglected, and it was—and is—my job to bring them out of the shadows and into the reading light. As I began my research, sifting through online listings and paper records, I realized these women found a home, more often than not, in the pages of EQMM. Fred Dannay’s editorial sensibility from the magazine’s 1941 birth onwards was very kind not only to detective stories, but to suspense tales that centered around character and, in particular, family and domestic situations. With a list in hand, I ventured to Greenwich Village on a sweltering July afternoon on a mission: The mystery bookstore Partners & Crime, I knew, had dozens of old EQMM issues for sale. I wasn’t sure how much they cost, one by one or in bulk, or if I’d be allowed to go through them piecemeal. But the daytime bookseller Steve Viola, whom I’d known for more than a decade—dating back to working occasional weekend shifts as a respite from graduate school, was kind to grant my wish. For the remainder of the afternoon, I sat on a couch at the back of the store, carefully going through issue after issue searching out hidden gems by writers previously unknown to me. 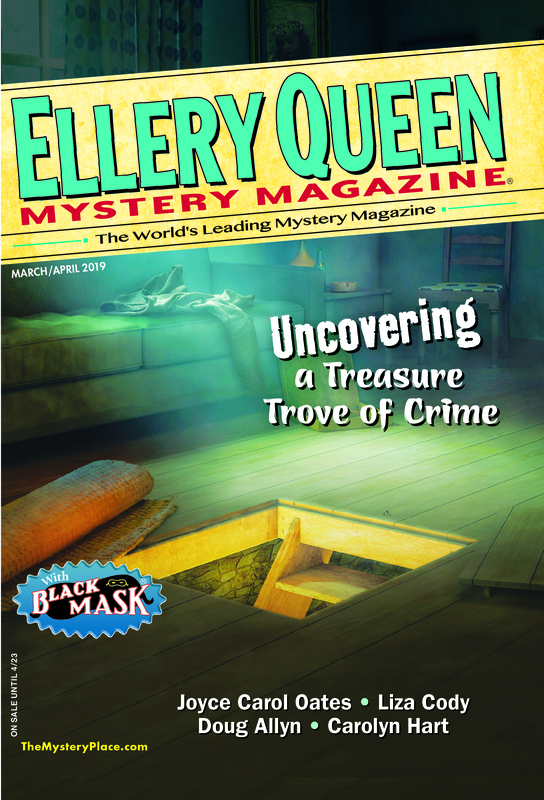 That glorious afternoon reminded me anew about what made EQMM stand out from issue number one: Dannay’s insistence on excellence, a wide-ranging taste for mystery stories of all kinds, and a strong mix of new blood along with choice reprints. The hours of sifting also revealed that my thesis wasn’t a half-baked one: there really was a group of female writers who, because their creative endeavors centered more around family and domestic terrors, didn’t get the same sort of recognition as their male peers, but always had a home at EQMM. My story ends on a bittersweet note, as those in the mystery world well know: Partners & Crime closed mere months later, after eighteen years in business. It turned out my search and shopping spree was, in actual fact, a liberation movement. And the store is yet one more thing, among so many, that EQMM outlasted. This entry was posted in Anthologies, Bookshops, Ellery Queen, Guest, History, Magazine, Writers and tagged ahmm, alfred hitchcock, anthology, back issues, domestic suspense, elleryqueen, elleryqueenmm, eqmm, history, partners in crime. Bookmark the permalink. I certainly look forward to that anthology. It fills a need. But the writers you’re talking about got plenty of recognition in their time. It’s now they don’t get appropriate recognition because of the way history of the mystery genre as generally understood has been distorted. There are many worthy writers, male and female, who were successful and well-regarded in the 40s and 50s but are mostly overlooked today because they don’t fit the revisionist history, which includes as one of its truisms that women mystery writers were a downtrodden underclass until the 70s and 80s. An important point: Anthony Boucher, whose post with the NY Times made him the most influential American mystery critic of his time, was every bit as enthusiastic about women writers as Fred Dannay. And many (maybe most) of the other major mystery reviewers at that time were women, as were many (maybe most) of the major mystery book editors. Thanks so much for your comment. You are quite correct to stress that it’s more of a latter-day amnesia, and the introductory essay to the anthology elucidates many of your points — especially to Anthony Boucher’s championing of the women writers in question, as well as their critical and commercial success during their writing lifetimes — more clearly, I hope. Of course, there’s a whole other piece to be written about the mystery critics of the same time frame who don’t have the current recognition of Boucher or Dorothy B. Hughes…. The Oklahoma Choctaw crime writer and reviewer Todd Downing in his 1930s crime fiction reviews highly praised women writers. These included Mary Roberts Rinehart, Mignon Eberhart, Agatha Christie and Dorothy L. Sayers, for example, but also many names far less known today. The reviews are collected in my book “Clues and Corpses: The Detective Fiction and Mystery Criticism of Todd Downing (2013).” In the 1940s and 1950s, Downing was a great reader of Dorothy B. Hughes and Margaret Millar in particular, but also Charlotte Armstrong. What I find surprising is that, as Jon Says, modern genre critics have so largely been neglectful of writers such as Millar and Armstrong. So much of the focus has gone into this dichotomy between male hard-boiled American writers on the one hand and female “cozy” British writers on the other, Writers who don’t fit into this framework tend to get ignored. I’ve written about this problem a great deal in my work and I certainly welcome Sarah Weinman’s anthology, surely another step in the right direction. I agree – strongly! After many years, I now have a complete run of EQMM, and have been indexing issues for the FictionMags list (http://www.philsp.com/homeville/fmi/0start.htm). The greatest fun has been re-reading the stories and seeing the patterns from decade to decade.